Ibiza is one of the Balearic Islands in Spain. It's a popular tourist destination that is famous for its wild nightlife. Many visitors spend their days hanging out on the beaches and their nights at some of the many bars in Ibiza Town or San Antonio. 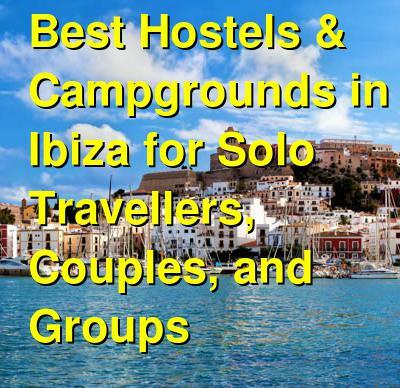 There are some decent hostel options in Ibiza that appeal to the young backpacker crowd. Do keep in mind that if you're looking for a party, you often have to head out from the hostels though, as many are actually a little quieter than you might expect. With only a handful of exceptions, there aren't as many party hostels around the island as you might expect. How much do hostels in Ibiza cost? Giramundo Hostel is the perfect place for young travelers who are looking for fun. It was started by travelers for travelers and it is designed with an international flare that uses lots of color and light. The hostel has several common areas including a shared kitchen. This is a great place to stay if you're hoping to meet other travelers as there is no shortage of places to hang out and relax. The staff is also very friendly and social. The hostel has all kinds of amenities for guests including complimentary breakfast, wi-fi throughout, discounted tickets and passes to clubs, and free parking. They also host regular boat trips and parties. The hostel has a great location near Playa Figueretas. It's about a five minute walk to the beach and a ten minute walk to the bus station and there is plenty to see and do in the area. The hostel has a wide variety of room types available. There are singles, twins, doubles, and three bed private rooms. There are also dorms that sleep four, five, six, or eight people. Hostal La Bartola is another hostel in Ibiza. It's a good option for young travelers who want comfortable but budget friendly accommodation. It's located about half a kilometer from the port of Ibiza and Dalt Vila Castle. In this area you'll find plenty of shops, bars, pubs, and restaurants. It's also just five minutes from the major bus stops in the area that will take you to the nearby beaches and villages. You can also walk to the beach in about fifteen minutes. The hostel has 18 rooms in total that are split between three floors and there is an elevator for your convenience. The rooms have either one, two, or three beds, as well as dorms. Each room is air conditioned and has a fan, television, refrigerator, and free wi-fi. Guests who are staying in dorms are also provided with a security locker. This hostel is a clean and comfortable place to stay that is a good value for the money.